Two Tyrone farmers will be in contention for the prestigious Gold Cup at this year’s British Dairy Farmers Livestock Event in Birmingham. It’s the premier UK national dairy herds competition, recognising efficiency in commercial milk production. Entry to the event on July 6th and 7th at the National Exhibition Centre outside Birmingham is free for all visitors. David Irwin and his father Alan run a herd of 170 redhouse Holsteins at their farm near Benburb. The farm is located near the River Blackwater in the townland of Derrycreevy. The other family members involved in the enterprise are William Irwin, Ida, Sylvia, and Jayne. 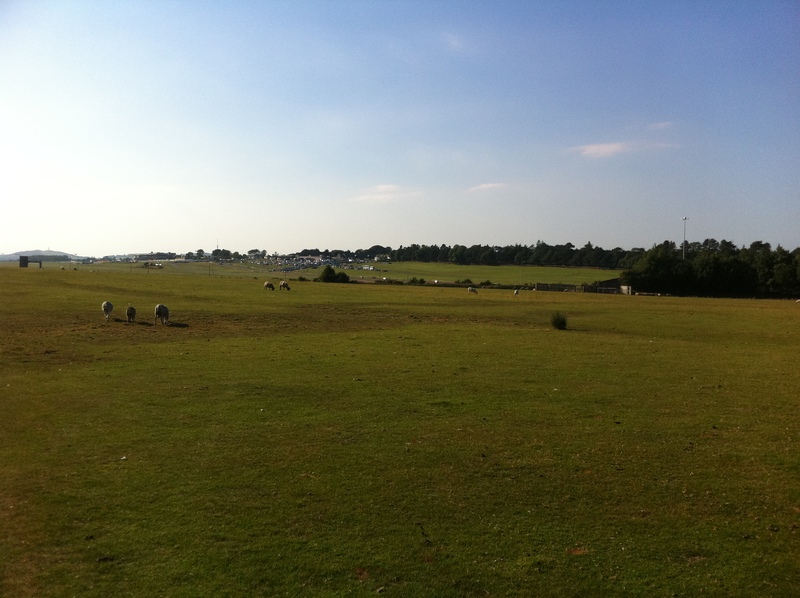 Their land comprises approximately 240 acres of grassland and cereals. A lot of it is too steep or too wet for cutting silage or growing cereals. Most of the land is heavy soil over red clay. Approximately 120 acres of silage is made in each of three cuts to supply the stock with forage all year round. Fifty acres of spring barley is grown each year to supply whole grain cereals and straw for feeding to stock. The farm was initially a mixed dairy, beef and arable farm. The cows were lost to brucellosis in 1974. The present herd started in 1979 with bought in heifer calves in 1977. No stock has been purchased since 1979. The dairy herd was increased and beef gradually phased out, until the present day herd of cows and replacements. The cows are milked three times a day and the milk is sold to Fane Valley Co-op. All the work is carried out on the farm by the Irwin family and two full-time employees. The work undertaken includes all silage making, slurry spreading and cereal making. The second Tyrone farmer to compete in the Gold Cup final is Adrian McFarland from Omagh. The two Northern Ireland entrants will be up against two competitors from Scotland, one from Wales and one from England. The annual event is organised by the Royal Association of British Dairy Farmers and attracts more than 400 exhibitors covering thirteen unique product zones. Exhibitors are on hand during the two-day event to demonstrate all-new equipment, products and services to over 17,000 UK and International livestock farmers. The Gold Cup is the top award in British dairy farming and is open to all dairy herds with official milk records and meeting the criteria of at least 100 cows in the herd, an annual average cell count of 200,000/ml or less and a £PLI value which is breed specific. Entrants complete a detailed questionnaire giving herd performance data, including production, feed, health and fertility information. Finalists are selected and visited by the team of judges, and each finalist is judged on factors such as physical and management performance, environmental schemes and their future plans for the dairy business. The winner will be announced and presented with the Gold Cup at the Livestock Event. British Agriculture Minister George Eustice MP will officially open the event on the first day, and will be responding to visitors’ queries on the outcome of the Brexit referendum and its implications for the industry’s future. The Association itself has adopted a neutral stand on the issue. Mr Everington adds: “We are looking forward to welcoming farmers, stockmen, students, vets, consultants and suppliers, arriving with an open mind and being prepared to embrace change. The future is in their hands.” To pre-register for a free ticket see www.livestockevent.co.uk. Flights from Belfast and Dublin to Birmingham arrive at the international airport, which is within walking distance of the National Exhibition Centre. TravelSolutions of Belfast (tel. 048-90455030) can provide a booking service for individuals or groups. Forage Field: designed to help all livestock farmers learn more about how to exploit the massive potential of home grown forage, in particular grass, the most cost efficient feed. Forage Field is a hands on practical area that will be split in to two; making more from grass and forage options, and saving silage costs by reducing dry matter losses and improving clamp consolidation. Calf rearing demonstrations: showcasing a variety of feeding and housing systems including live calves in igloos, conventional and specialist buildings, all of which are designed to improve rearing efficiency of both dairy and beef calves. The feature will be complemented by a series of knowledge sharing seminars delivered by leading youngstock specialists discussing the latest in nutrition and management. Machinery Demonstration Arena: a new working demonstration featuring mixer wagons, loaders, bedders and straw choppers – essential kit for most intensive dairy and beef farms. Visitors will be able to observe and compare models and weigh up the cost saving opportunities as they are put through their paces. Foot trimming / Healthy Feet: return of one of the most popular demonstrations. Foot trimming will feature the Dutch Five Step method using both a knife and grinder repeated four times each day, and supported with independent commentary and additional information on locomotion. Healthy Feet is a practical workshop, supported by AHDB, designed to help farmers understand more clearly what causes lameness, its impact and how to reduce incidences. Each session will focus on how to recognise lameness in the early stages, followed by prompt and effective treatment. Livestock Learning: a new conference theatre designed to offer all dairy, beef and sheep farmers practical advice delivered by specialists and covering a comprehensive range of topics from health to grassland livestock systems. There will also be an opportunity to ‘ask the farmer’, with some of the UK’s award winning farmers taking to the platform. RABDF Presentations Forum: an opportunity for livestock farmers to glean useful information on a wide range of subjects affecting their businesses including; Decisions4Dairy, tools for survival, how to sell milk at £2 per litre (a niche market for unpasteurised milk), controlling Johne’s and dealing with farm safety issues. It’s estimated that 60% of British dairy farmers do not know the rolling costs of their milk production. Beef Arena: another new feature focused on measuring and monitoring to help all rearers and finishers improve their management systems. The arena will feature live EID demonstrations of leading equipment; livestock specialist Miriam Parker will talk through handling systems whilst the central area will be dedicated to weigh crates, cells and accompanying software. Livestock showing: dairy, beef and sheep will all feature in the show ring: six different breeds within the National Dairy Show including Ayrshire, Brown Swiss and British Friesian cattle societies each staging their national shows, along with British Charolais Cattle Society, the South Devon Herd Book Society will be holdings its second performance championship. The Lleyn Sheep Society will be highlighting what this commercial sheep breed has to offer. A Bord Pleanála oral hearing begins on Monday 7th March into EirGrid’s latest proposal for a North/South electricity interconnector, one of the largest ever infrastructure projects in the history of the state. Two inspectors from the Planning Board began hearing submissions at the Nuremore Hotel in Carrickmacross. 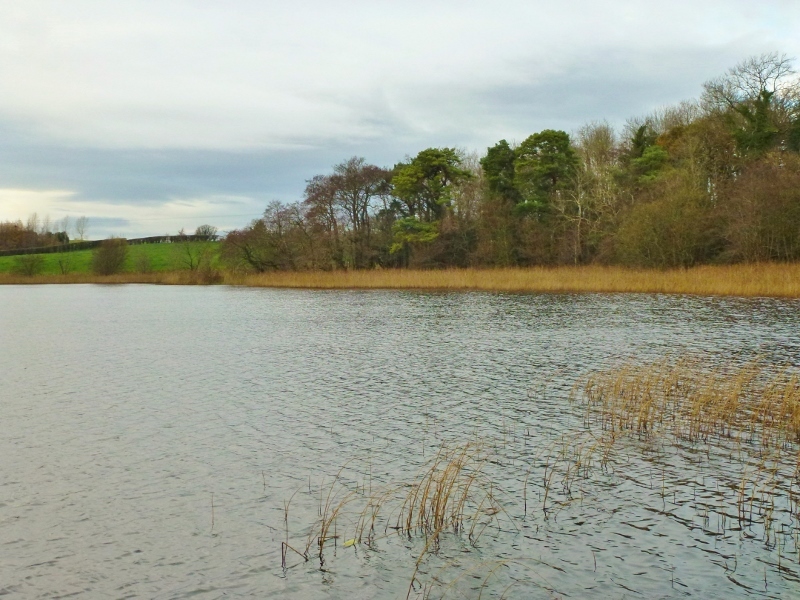 The plan proposes building 299 pylons in the Republic to carry a high voltage (400kV) power line from Woodland in Co. Meath where there is an existing substation to Turleenan near the Moy on County Tyrone. It would pass through Meath, a small part of Co. Cavan near Kingsport and then through 42 town lands in Co. Monaghan. The line is due to cross the border at Lemgare near Clontibret, beside Derrynoose in Co. Armagh. The line is a total of 135km long. The Northern Ireland section is subject to a separate planning application by EirGrid’s subsidiary SONI. 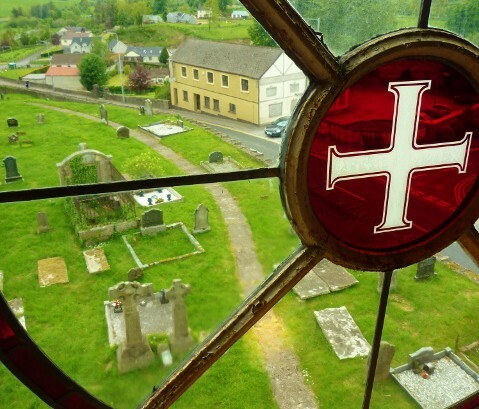 It is under review by the Planning Appeals Commission, which will hold a preliminary public hearing in Armagh on June 21st to examine legal aspects of the application. The Commission was requested by the NI Department of the Environment to conduct a public inquiry under Article 31(2) of the Planning (Northern Ireland) Order 1991 for the purpose of considering representations made in respect of the 2009 application. The inquiry opened on 6th March 2012 but was adjourned on 20th March 2012 when it came to light that the application and the environmental statement and its addenda had not been properly advertised in the press. The Commissioners recommended that before it was re-advertised, the environmental statement should be consolidated and updated to take account of changes put forward by the applicants in their evidence to the inquiry. On 9th October 2014, the NI Environment Department renewed its request for a public inquiry into the 2009 application for the electricity interconnector proposal and asked that it be conjoined with an inquiry into the 2013 application for associated works. Copies of a consolidated environmental statement relating to both applications had previously been forwarded to the Commission. However, in a further letter dated 18th November 2014, the Department informed the Commission of the applicant’s intention to submit additional environmental information relating to the trans-boundary landscape and visual effects of the proposed development. the Department confirmed that it had in its possession all the environmental information it considered necessary to meet the requirements of the Environmental Impact Assessment Directive and Regulations. System Operator for Northern Ireland welcomed the news that the PAC public enquiry would recommence in June. It said the North South Interconnector was required urgently for security of electricity supply in Northern Ireland. It said the proposed project would reduce electricity prices and provide Northern Ireland with a secure electricity supply by linking the grids in NI and the Republic. “We are pleased to have been notified by the PAC about the recommencement of the public inquiry into the North South Interconnector. It is a critical piece of infrastructure, essential for a secure supply of electricity for Northern Ireland. It will also significantly reduce the cost of electricity for consumers across the entire island and will allow us to increase our use of renewable energy, reducing Northern Ireland’s reliance on imported fossil fuels. SONI has worked tirelessly to progress the planning application to make these benefits a reality. SONI’s specially appointed Agricultural Liaison Officer Fergal Keenan, is available to provide information about the project and can be contacted directly at 07966-930844 or via email fergal.keenan@soni.ltd.uk. “I’m thinking mainly of the Red Hand, that ubiquitous symbol of Ulster. Unlike most emblems, it straddles the political and sectarian divide. And on both sides, it’s usually the right hand (dexter) that’s depicted, although there are quite a few left hands scattered around Belfast on coats of arms and other insignia, with apparently equal indifference. This is all the more surprising given that there are two competing explanations for the symbol’s origins. One is religious, referring to the hand of God (His right, invariably), a meaning mentioned in Milton’s Paradise Lost and a Nick Cave song, Red Right Hand, among other places. The alternative is the prehistorical myth of the Iberian invaders, promised Ulster as the prize in a boat race. The first to touch it would win, so within sight of the finish, the most committed of the trio chopped his hand off and threw it ashore, a result that withstood the subsequent stewards’ inquiry. By the law of averages (and most versions of the story), however, it was the invader’s right hand that did the chopping, and therefore his left that claimed the reward. Maybe that explains some of the left-hand versions in Belfast. But then again, as far as I can see, loyalist murals, just like GAA insignia, tend to go with with the right. Not that the Red Hand is entirely the property of Ulster. It used to symbolise Ireland in general. And again, this could be ambidextrous. You see lefty versions on, for example, old cap badges of the Irish Citizen Army. But I suppose there is a certain logic in that. The foot question has its contradictions too. In the South, it is Protestants who are (or were) said to the dig with the left. In the North, the same claim was made of Catholics. The point in both cases was that they were the minority. Whichever foot they dug with it, it was the “wrong” one. One the other other hand (no pun intended), that great student of Ireland’s idiosyncrasies, (QUB Professor) E. Estyn Evans, once went into the subject in meticulous detail and found a depth of meaning in it that few who used the phrase could have suspected. In his 1957 book, Irish Folk Ways, he wrote that most diggers in Ireland used the right foot – a habit reinforced by the traditional one-sided Irish spade, or “loy”, which unlike the English version, didn’t offer a choice. But he added that, “in eastern Ireland, and particularly the Protestant districts of the north-east, the left foot is normally the digging-foot […] though the old Irish stocks continue to dig with the right”. In general, he marvelled at the “astonishing variety” of spades here, as witnessed by a Tyrone factory that specialised in the product. Its “spade gauge book”, he reported, had 230 different patterns. The left hand version (sinister) of the symbol has been used by the Irish National Foresters, the Irish Citizen Army and the Federated Workers Union of Ireland, subsequently SIPTU. 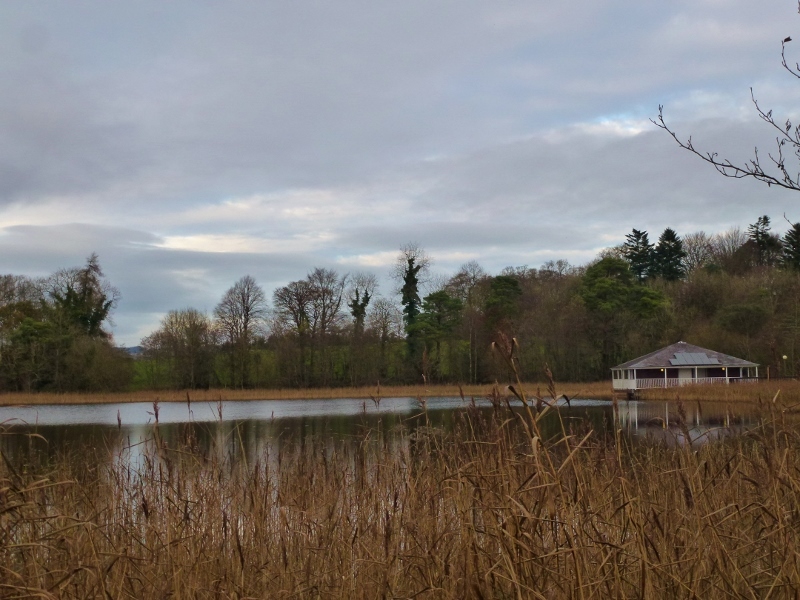 Whilst visiting Fivemiletown in County Tyrone recently I took the opportunity to visit the Round Lake amenity area for the first time. 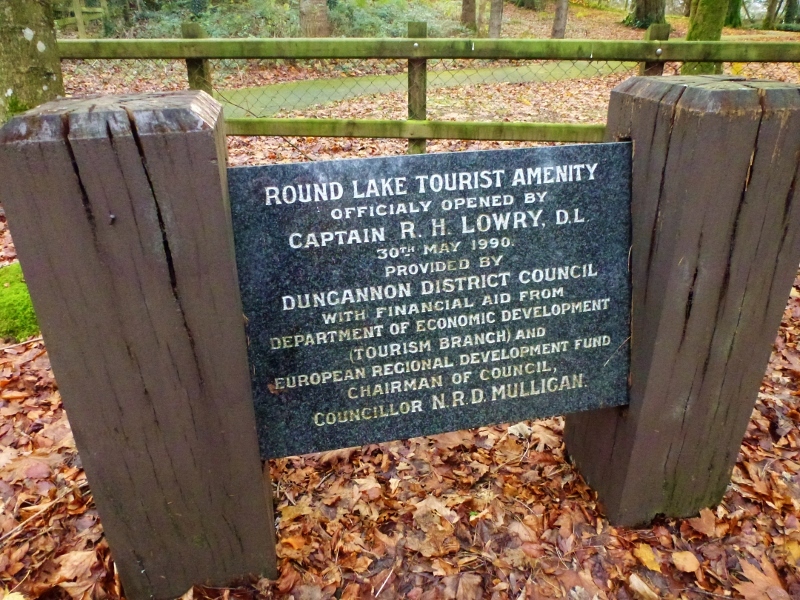 It used to be part of the Blessingbourne estate but since 1990 has been run by Dungannon and South Tyrone Borough Council. There is a caravan park there with twelve fully serviced hard standing pitches. But this time of year there are no customers. 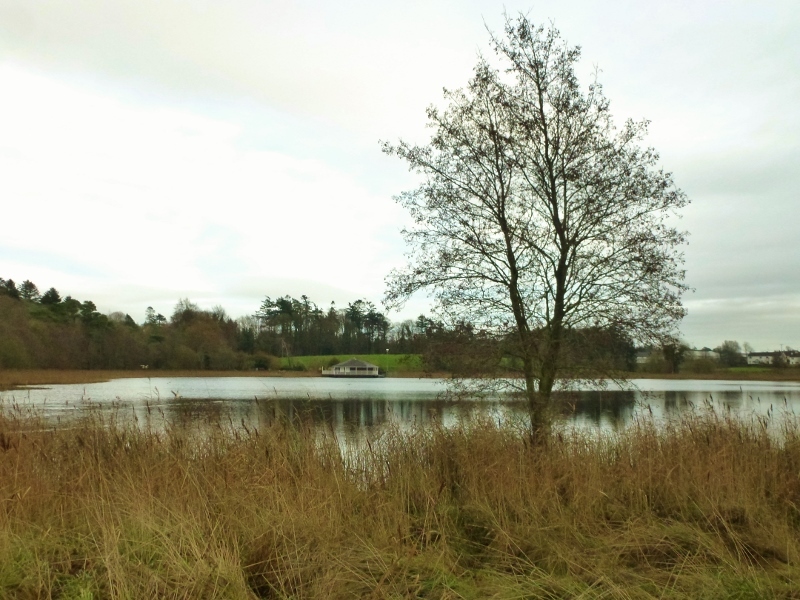 The site has a pavilion, which looks underused, on the side of the lake, where angling is permitted and if you are lucky, bream and roach can be found. There is a tarmac path around the lake and it provides a pleasant walk of about fifteen minutes. On the other side of the Fintona Road you will find the entrance to Blessingbourne self-catering accommodation and the Mountain Bike Trails. Please note that the manor house built in the 1870s and owned by the Lowrys is private. It was a simple and very dignified ceremony. As motorists were passing by on the main A5 Dublin to Derry road, they might have wondered what was going on at the side of the road at Curr, between Ballygawley and Omagh. 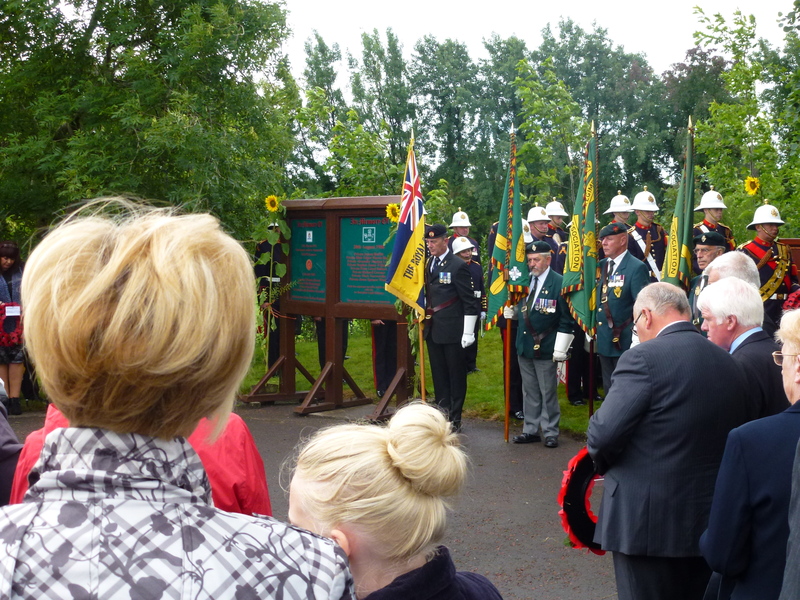 People gathered there on Sunday morning to pay their respects to eight British soldiers who had been killed in what became known as the Ballygawley bus bomb, 25 years ago today on August 20th 1988. 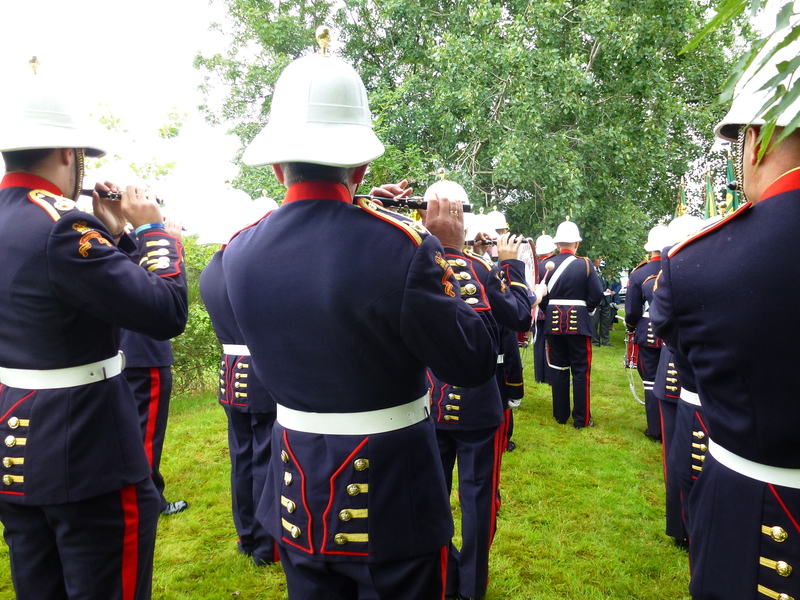 The music by the Omagh Protestant Boys flute band set the mood. You can see my video on youtube here. 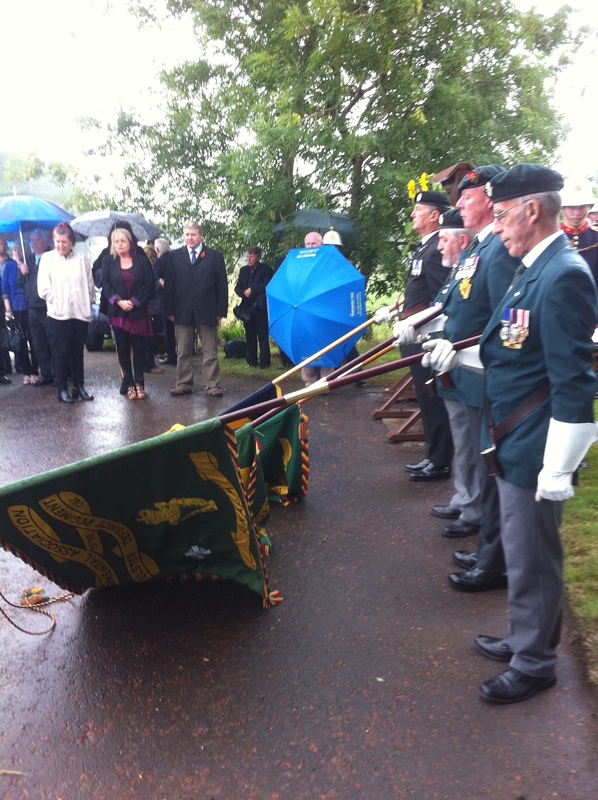 The soldiers were returning to their base in Omagh, having flown into RAF Aldergrove. They were being transported in an unmarked coach, driven by a soldier. Reports at the time suggested that although the A5 road was meant to be ‘out of bounds’ for military transport, diversion signs had been put in place and that was why the driver travelled that way from Ballygawley. But that claim was disputed at the inquest. A 200lbs roadside bomb consisting of Semtex and fertiliser exploded, killing eight members of the 1st Battalion, Light Infantry Regiment and injuring 28 of their colleagues. Private Blair Bishop (19), Private Peter Bullock (21), Private Jayson Burfitt (19), Private Richard Greener (21), Private Alexander Lewis (18), Private Mark Norsworthy (18), Private Stephen Wilkinson (18) and Private Jason Winter (19). 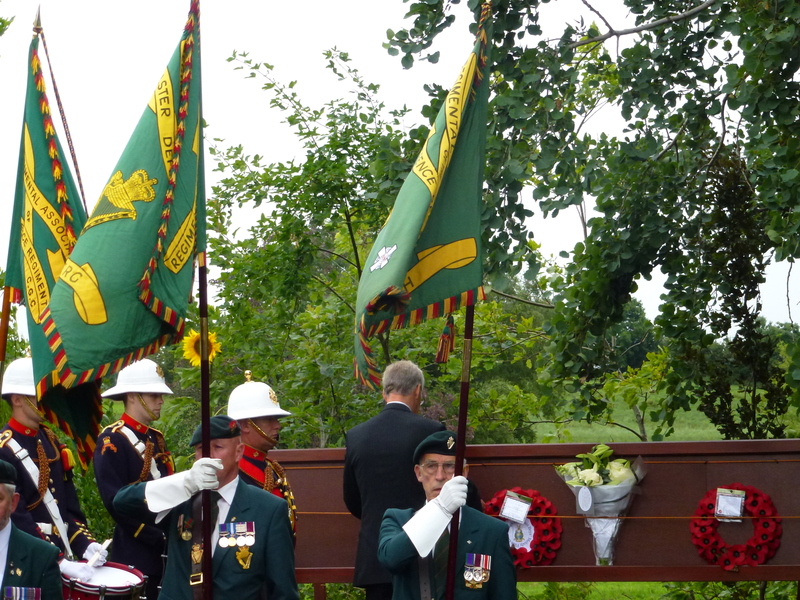 In addition, four UDR members killed in a landmine at Gort, Errigal Keerogue, near Ballygawley were also remembered. They died on July 13th 1983, 30 years ago. 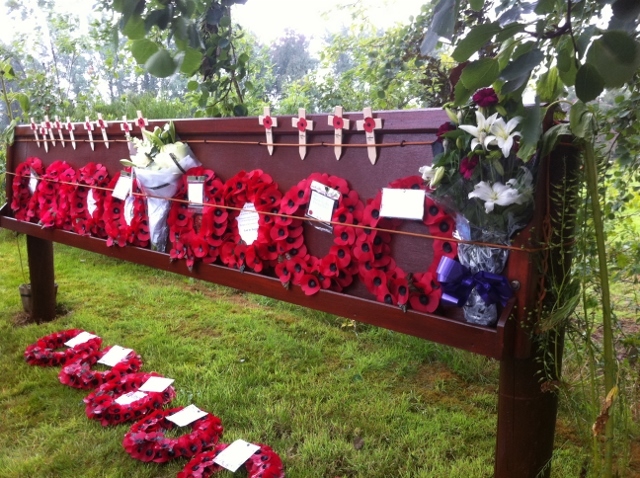 They were:- Private Ronald Alexander (19), Corporal Thomas Harron (25), Private John Roxborough (19) and Private Oswell Neely (20). A thirteenth name was added to the roll of honour, Lieutenant Andrew Somerville (20), a member of 15th/6th Lancers, killed in a landmine attack near Ballymacilroy, Ballygawley on March 27th 1973, 40 years ago. MONAGHAN supporters have been a long time waiting for an Ulster senior title: 25 years, in fact. Having waited so long it was nice to be able to claim a double at Clones, added to a fourth-in-a-row Ulster final victory by the ladies last weekend against Tyrone. It was very appropriate that having introduced the members of the 1988 Monaghan team to the crowd at half-time, the seniors went on to beat the current All-Ireland champions Donegal and take the Anglo-Celt Cup. It was even more special because two hours earlier the Monaghan minors had put in a fantastic finish to win the title for the county for the first time in 68 years. 1945 was the last occasion when Monaghan minors took what was only their third Ulster title. A man in the seat beside me in the Pat McGrane stand remarked that one of the stars of that side was from his parish in Sutton Dublin, namely Mackie Moyna from Scotstown, twin brother of Tommy. Mackie’s wife Margery (Boylan), a former teacher also from Scotstown, died recently. Rest in peace. 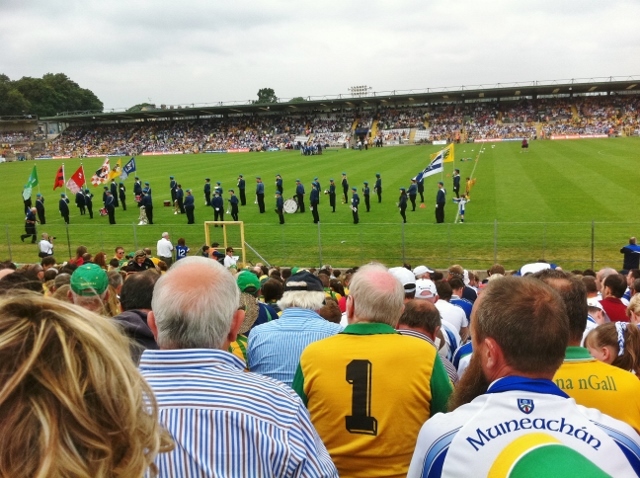 UPDATE: Since writing the blog yesterday, I have listened back to the end of the minor game commentary on Northern Sound by an almost hoarse Sean McCaffery. He lists the names of the victorious 1945 side and among them was Tommy Moyna, but not Mackie, so my informant was mistaken. However I did find one report on the Hogan Stand website when the twins received Monaghan GAA Hall of Fame awards in 1993. It explained how Mackie made an unregistered appearance in a Monaghan minor jersey at Croke Park in the all-Ireland semi-final in 1945 against Leitrim! 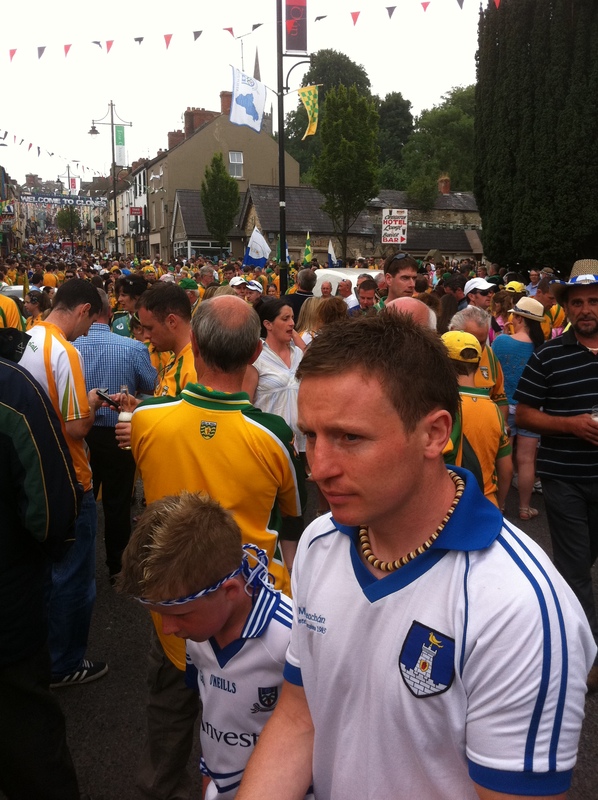 As usual, the atmosphere in Clones in the build-up to the two finals was tremendous: a sea of colour all along Fermanagh Street. Family groups that travelled from Donegal or further afield finding a suitable green patch on which to have a picnic. Others packing into the several pubs and debating the chances of their team. 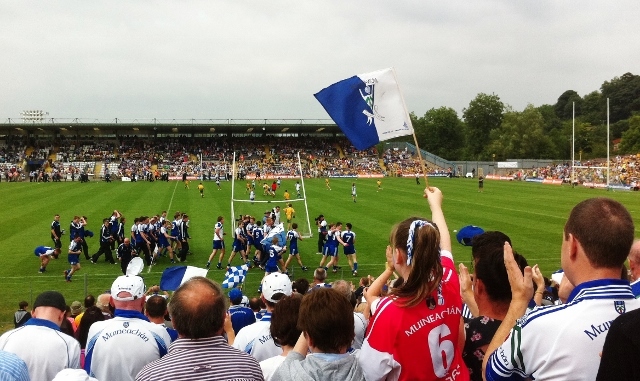 How long more the Ulster Council of the GAA will keep the final at Clones is another matter; hopefully this will not be the last time Monaghan win an Ulster senior title at Clones. The excellent match programme (€5/£5) contained an article about the planned redevelopment of Casement Park in Belfast, which has already been upgraded with floodlights. As someone who collects sports programmes, I believe this one will be in demand in years to come. I had listened to some of the first half of the minor match on the car radio. When I took my seat, Monaghan were trailing by five points and the chance of a victory seemed to have slipped away. But a penalty (a bit fortunate) in the closing moments of the game was slotted home by Fearghal McMahon, giving them a single point advantage. It was followed by a Donal Meegan point in injury time, thus ensuring a Farney victory 4-10 to 2-14. Tyrone had led 1-9 to 2-1 at the break. 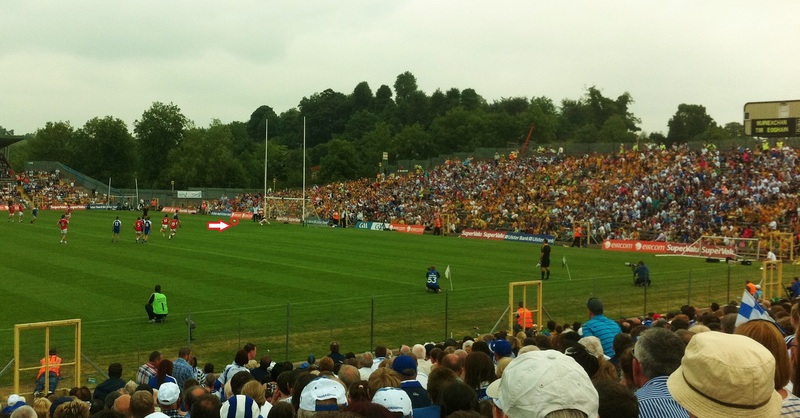 The key to Monaghan’s victory in the senior match was the way they controlled Donegal right from the throw-in. They were four points up within nine minutes. Donegal’s opening score came in the 31st minute through a Colm McFadden free, followed by a Frank McGlynn point in injury time, making it 0-5 to 0-2 in favour of Monaghan at the break. The Farneymen were soon on the scoreboard again in the second half, through Kieran Hughes. 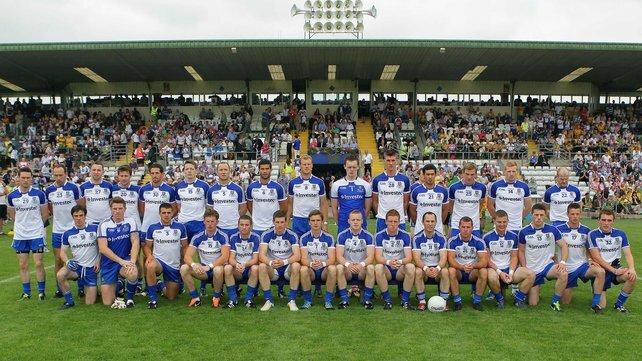 Monaghan continued to dominate and were the better team throughout. Nice to see Tomás Freeman coming on as a substitute at the end and contributing an insurance point. The final score 0-13 to 0-07 for the home side. Then it was time for a massive celebration with thousands among the crowd of 31,914 invading the pitch to join the excitement as the Anglo-Celt cup was presented by the President of the Ulster Council, Ballybay man Martin McAviney, to the Monaghan captain Owen Lennon. Watching the proceedings was the GAA Ard Stiúrthóir Páraic Duffy, another proud Monaghan man! Former GAA President Sean McCague from Scotstown who managed the winning 1988 county team was also there, as were many other Monaghan personalities including Big Tom McBride who played on Saturday night at a country music festival in Monaghan town. The Curragh of Kildare. Racecourse in background. Travelling to Kildare to watch the Lilywhites take on the Red Hands from Tyrone, my route to Newbridge took me past the Curragh. As I approached the town on the motorway, I listened to RTÉ Radio sports coverage and discovered there was a meeting on at The Curragh. I heard the commentary on the 5:40 race (Invesco Pension Consultants Minstrel Stakes) which was won by the 8/11 favourite Darwin, ridden by JP O’Brien. By the time I reached the entrance to the Curragh military camp, the racegoers were preparing for the main event, the Darley Irish Oaks. So I stopped to look over towards the main stand and I could see that there was a good crowd, judging by the number of cars. For the record, the 6:15 race was won by Johnny Murtagh on Chicquita, at a price of 9/2. A stewards’ inquiry was called after the half-length success but the placings remained unaltered. On then to Newbridge and my first job was to locate the GAA pitch. It couldn’t have been easier. I observed a crowd of Kildare supporters walking down the Main Street and saw them going up a lane beside the Town Hall (an old garrison church), where there was a big banner for Newbridge 200, a bicentenary celebration that started last September and will become the Newbridge Grassroots Festival. 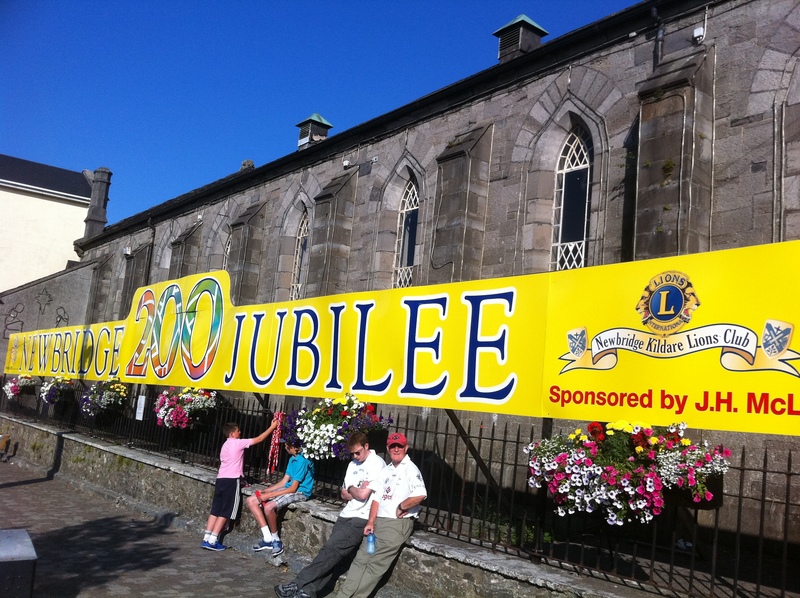 The local Newbridge Kildare Lions Club logo was prominent: well done, fellow Lions. Parking was found at a nearby private car park at a rate of €1 an hour, which was very reasonable. It took five minutes to walk to the ground. The pubs and shops seemed to be benefitting from the influx of trade. So please, no more sports arenas perched in the middle of nowhere on a ring road or beside a motorway. The crowd was just under 7500 and they managed to enter and exit without any great problems.